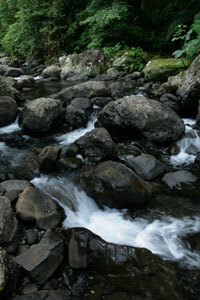 - Real primary forest, big mountains and numerous rivers. - Excellent diving, including the famous S.S. Coolidge. - Crystal clear freshwater 'blue holes'. 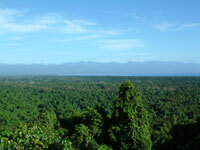 Santo has Vanuatu's highest peak, Mt Tabwemasana at 1879m above sea level, and the longest river, the Jordan. Copra and beef cattle, established along the south and east coasts power Santo's economy. The island's only town is Luganville in the south. It's basically a one street town with banks, trade stores, internet, a hospital and most other services. East Santo and Luganville experience the trade winds. The dry season is four months, July to October. February is hot, humid and with regular cooling showers. 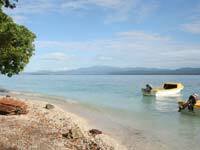 Santo is a good base for exploring the northern and central islands of Vanuatu. 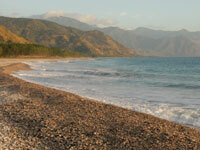 Ambae and Malekula are close at hand with frequent and inexpensive transport links. Maewo and Pentecost are only a little further away. From Santo it is much cheaper to travel to the Banks and Torres islands. Linking Santo and Port Vila there are direct flights and and "milk run" routes that allow you to stopover on islands in-between. 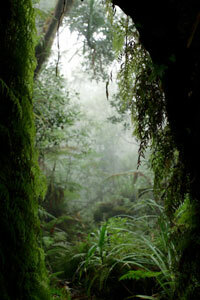 See our walking Santo page for some excellent jungle trekking adventures. Pekoa is an international airport and the weekly Air Vanuatu service to Brisbane, Australia was still running in 2012. Pekoa is also a busy domestic hub for the northern islands. 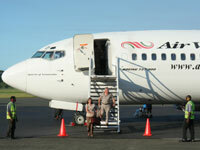 See the Air Vanuatu website for schedules and fares. Note that tourists with a return Air Vanuatu ticket are entitled to a 20% discount. The Lajmoli airport (west coast Santo) is serviceable but the schedule has been suspended indefinitely. The story is that since the plane crash in 2007, people are afraid to fly. If there are at least 6 people wanting to fly to Lajmoli then Air Vanuatu will send a plane. Luganville is Vanuatu's second biggest sea port. Ships to other islands can be found at the Simonsen (towards the airport) and Melcoffee (west of town) wharves. These ships are detailed on our many island pages, accessible via our Vanuatu map. Public transports on Santo come into town in the morning and return in the afternoon. There is enough traffic along east Santo now that hitching a ride is possible at any time during daylight hours Monday-Saturday (maximum wait about 30 minutes). 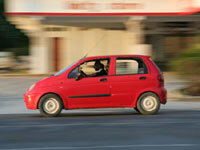 For groups, chartered trips can be economical and are much more convenient. You will see trucks and buses driving all about town, but will not know which ones are available for hire. Your host in Luganville should be able to help. There are two places to find transport in Santo. If you're heading up the east coast then go to the Unity Store and Pacific Petroleum station (formerly "Unity Shell"). Buses and market trucks leave from 1400h. There are always people waiting here and the pump attendants know all the drivers. Minibuses are preferable, for comfort and in case of rain. The east coast road has been sealed all of the way to Port Olry (completed in 2010) and taxis can now drive there. 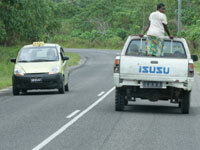 For south Santo, you can wait on the roadside across from the Luganville market house, in front of the clump of bamboo. It doesn't look like a truck stop but you will find people waiting here from about 1400h. To go to Ipayato and Tasiriki, a strong pickup is required and four-wheel drive in the wet season. There are rivers to ford. 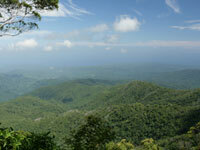 The road to Matantas and Big Bay has been improved and two-wheel drives can now go down there. There are one or two trucks regularly servicing Matantas. Alternatively, find a bus or truck to Sara and then pay extra (about 2000 Vatu) to go down to Matantas. Trucks to Big Bay Bush might also be hard to find in Luganville..
Last updated: October 2014 by Stephen.